It’s been awhile since we’ve posted here, but the subject of leather linings keeps coming up periodically, in different forms and forums, so it would be good to address it. 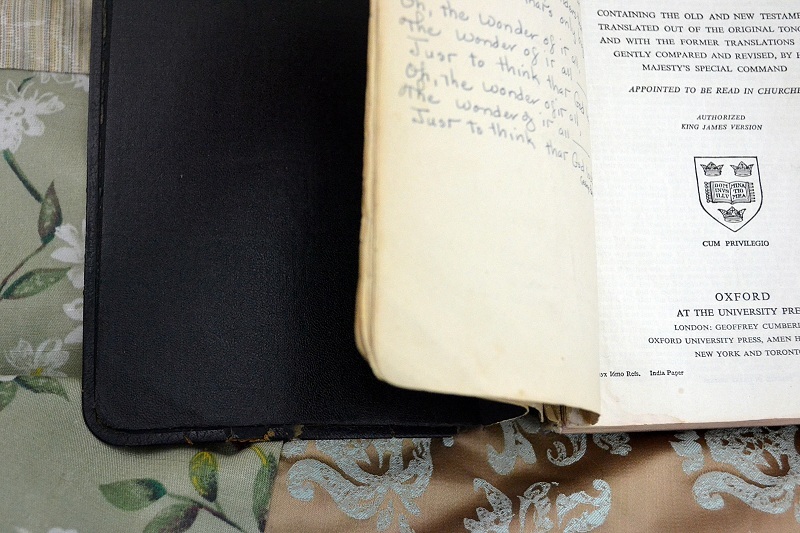 We know some of you love your leather-lined Bibles and we don’t want to detract from that, but we need to explain why we do things the way we do. As you can see from studying the pictures on our website, the way we construct our covers is the way book covers have been constructed for hundreds of years. We use an end page that is long; it’s glued down to the inside of the cover (the pastedown portion) and forms the inner hinge and the first, usually thicker, page in the book and at the end, the last one (the free end pages). Here’s an example of an end page we did this week with burgundy leatherette. We see this construction all the time. 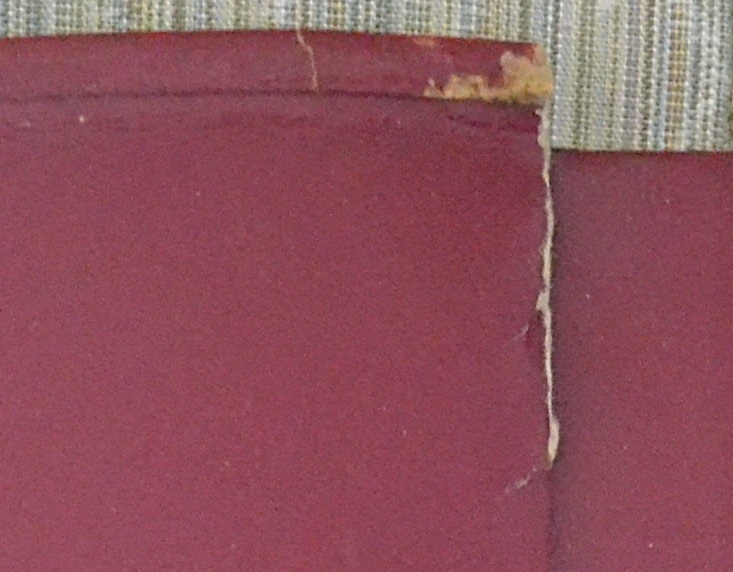 In a very, very old book, we can often see right through the end page where the bookbinder cut the leather crooked. We do try to cut our leather straight because end pages can’t really hide that kind of carelessness. But they do cover the raw edges of the leather. Bible manufacturers for the last 70 years or more have been using this system, from Oxford to Cambridge, to Holman … all the Bible greats. 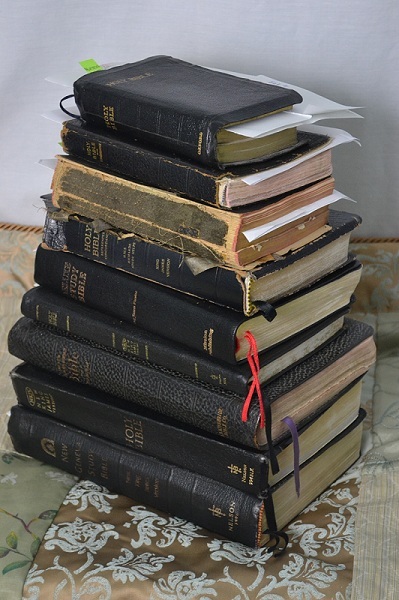 Here’s a stack of black Bibles that all came in for restoration in the last week. We’ll use some of them to illustrate this post (and a couple of others, too). Here’s a ’40s Oxford Bible (the one on the top). See what I mean about the end pages? 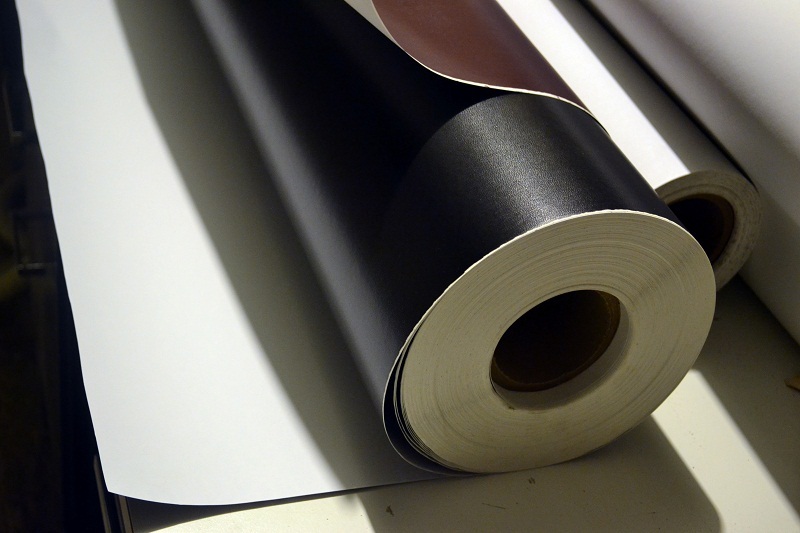 For softcover Bibles, we use a good grade of leatherette that is sold in 55-inch-long rolls of 250 yards per color. It’s a big investment when we must buy it, but quality end pages are important. Leatherette is not the same as bonded leather. It’s a shiny colored paper, standard in softcover Bible production. It’s strong and flexible and will last a good long time. Bonded leather, on the other hand, is a composite product made of leather dust and a bonding agent with a grain rolled into it. It makes a pitiful cover because it deteriorates with use. It also makes a pitiful inner lining material. We do not use it for anything. It’s like hot dogs — they look good but you don’t know what you’re getting. 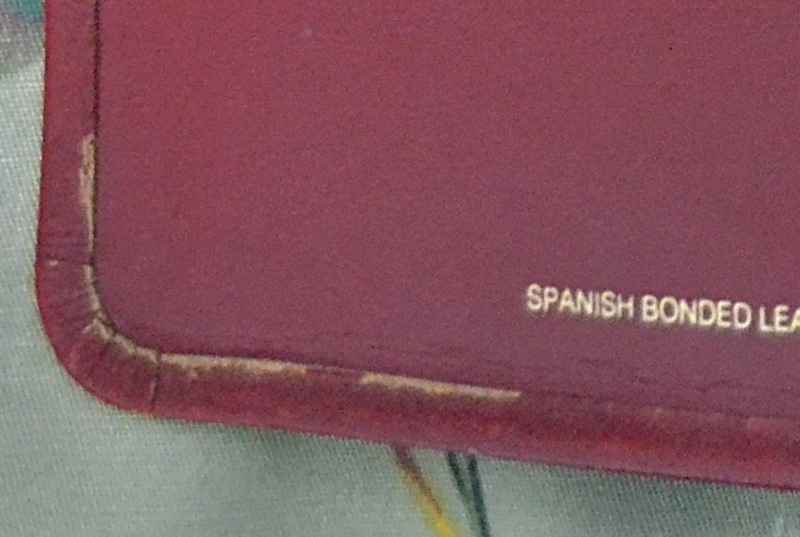 In our opinion, the words “bonded leather lined” do not speak of a classy cover. The above picture illustrates another way to construct covers besides the way we and others do it. That’s to fold the leather over the lining material all around the edges of the cover. The raw edge of the leather needs to go through a special corner crimping machine to make those perfect corners. This takes a very thin slice of leather, no more than one ounce in weight. We showed you the difference between our corners and manufactured machine corners in another post. Because we can make our own corners by hand, we can use thicker leathers. Most are at least twice as thick. In order for the one ounce leather not to tear, it will need to have a lining material to give it strength. It’s like vitamin-fortified cereal. But a full-grain leather already has strength because it’s naturally thicker. 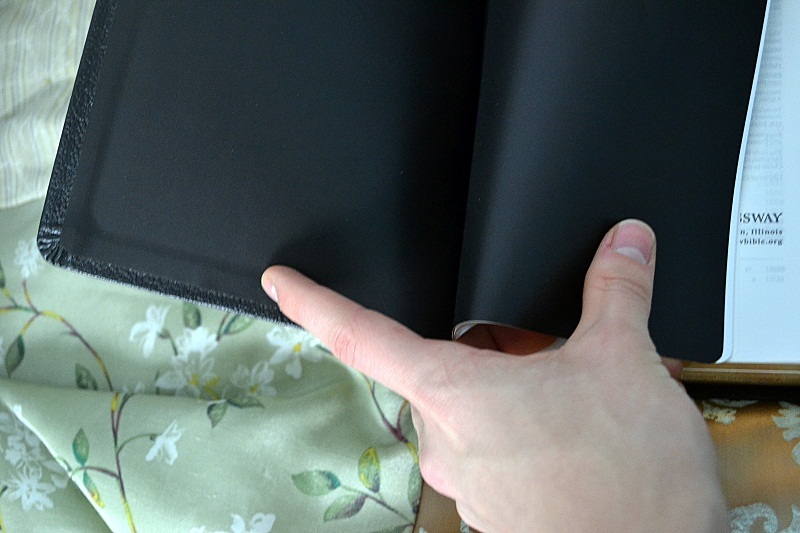 Lining materials such as a thin leather will keep the outside leather flexible. But then they must be fused to an end page of some kind at the inner hinge. 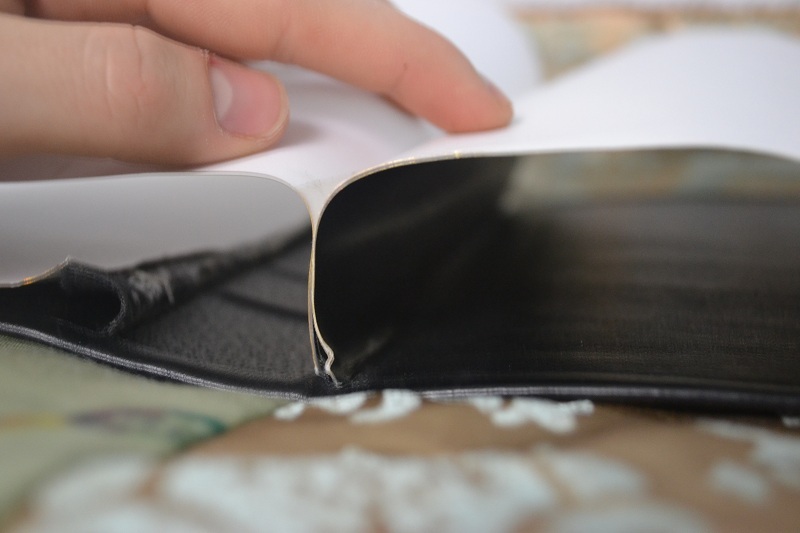 Whether the free end page is leatherette, linen paper, or construction paper, the leather liner has to be sandwiched between the end page and the adjoining flyleaf. This creates a stiff bulky spot at the front and back of the book. We’ve seen that bulky area take up as much as half of the end page. Our covers do not have that bulky area. 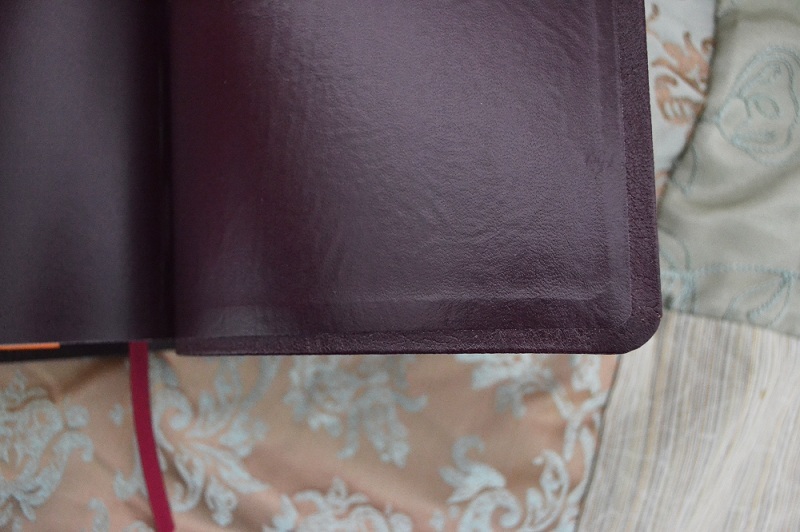 Here is a deluxe calfskin leather-lined cover we removed from a Bible to apply one of our covers. 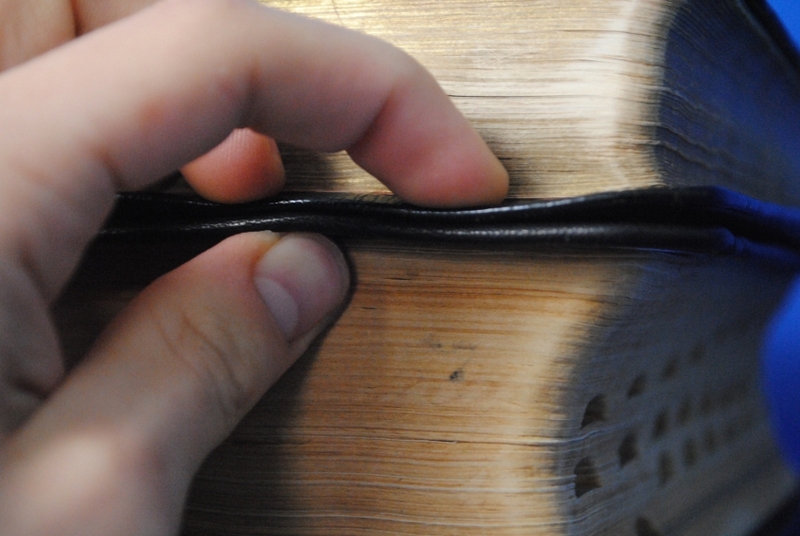 The stiffness is one of the problems of leather-lined Bibles. We use a thin fiber interior liner — the part sandwiched in-between the leather and the leatherette — to stabilize our leathers and not add additional stiffness. This maximizes flexibility without our having to use those very thin skived leathers. A problem we’ve seen with Bibles that are edge-lined — whether they’re lined with leather, bonded leather, or even leatherette — is that when that raw edge is folded down over the lining material and glued down, it can become unattached. It’s very difficult to fix the unsightly mess that ensues when that happens. Another problem shows up when the lining material deteriorates. Bonded leather will do it very quickly.. But you can’t correct that without deconstructing the entire cover. On the other hand, a Bible that has the end pages glued down over the raw edges is easy to fix if it pulls up — a little bit of white school glue will put it to rights. 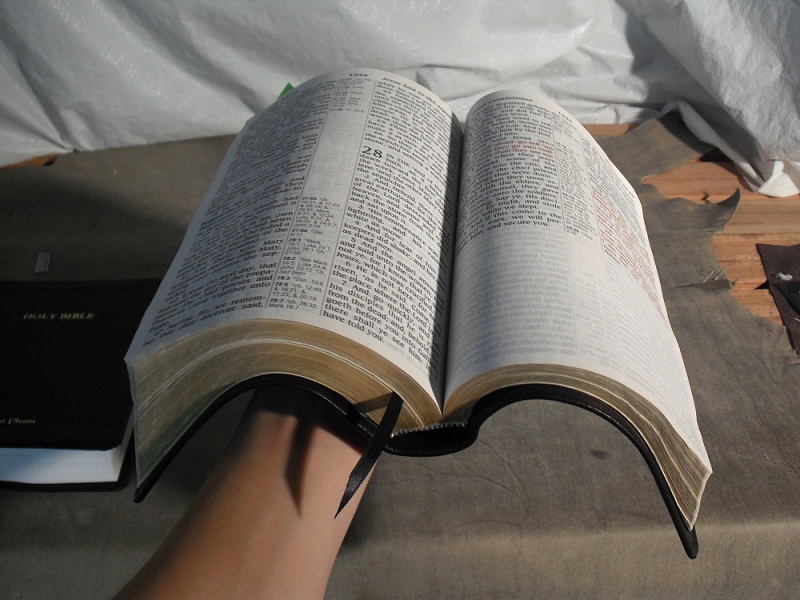 There’s a certain Bible manufacturer that uses a construction similar to ours, but they use a thinner leatherette. This is easy for us to correct. We pull up the end pages and glue down better ones. UPDATE: In 2013, we added our own leather-lined style, which didn’t have the problems we noted above. You can read about it here.